The Grand Funk Railroad/Friday Music 180 Gram Audiophile Vinyl Series Begins!!! Organically recorded, no overdubs, just amazing hard rock & roll! As our extensive Grand Funk Railroad 180 Gram Audiophile Series begins, Friday Music is proud to announce the amazing limited edition release of their mega-platinum 1970 legendary concert recording "Live Album." Featuring the original hard rock trio line-up of Mark Farner (guitar/vocals), Don Brewer (drums/vocals) & Mel Schacher (bass), this deluxe two-album set rocketed to the top of the charts & continues to be one of the most important and influential rock albums of all time! Featuring extensive live workouts of "Are You Ready" "Heartbreaker" & the hit single "Mean Mistreater", this historic Lp truly represents this band in their prime, as it also shines for the first time in the audiophile domain. Further smashes like their take on The Animals classic "Inside Looking Out" brought the power trio even more acclaim as the song not only became a huge rock track at radio, it even scored huge R&B success when the tune landed the album in the upper rungs of the R&B album charts that same year. More Grand Funk essentials like "Paranoid" and the album closer "Into The Sun" truly make this an enjoyable reminder how great this band was and still is to this day! 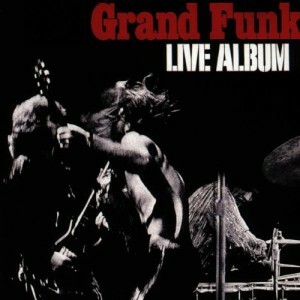 Friday Music is very honored to bring back for the first time on vinyl in many years the multi-platinum top charter "Live Album" by Grand Funk Railroad. Mastered impeccably by Joe Reagoso (Deep Purple/Yes/Alice Cooper) at Friday Music Studios, the masterpiece truly shines in the 180 Gram Audiophile Vinyl format. To further enhance your Grand Funk Railroad experience, we have also included the original gatefold cover art. Grand Funk Railroad...Live Album... First time release on impeccably mastered 180 Gram Audiophile Vinyl....From your friends at Friday Music.